Eat Your City: Pampa Brazilian Steakhouse Edmonton, AB - tasty meat-a-thon dinner! Pampa Brazilian Steakhouse Edmonton, AB - tasty meat-a-thon dinner! For a girlfriend's birthday, we gathered up the meatatarians amongst us and headed to the dimly lit, decorated in warm reds with dark tables and white linens Pampa Brazilian Steakhouse for dinner. Similar to lunch, you have full access to a range of pasta, cold meats, vegetables and salad items, but instead of five types of meat, there is ten varieties available to be sampled and noshed upon. There is prime rib steak, garlic rubbed steak, bacon wrapped chicken thighs, slow cooked beef ribs, and a leg of lamb in additional to the "lunch" meats: cumin scented lightly spiced pork sausage, sirloin picanha, Parmesan cheese pork cutlets, and roasted chicken drumlettes. Since its a birthday celebration, we all open up the drinks menu and browse while we wait for all the guests to arrive. There's a nice selection of both non-alcoholic and alcoholic beverages. On the non-alcoholic side of things, they have a nice variety of fresh fruit juices including a limeade sweetened with condensed milk. We skip over their almost daunting wall of wines that greets you when you first enter, and go with some Caipirinha's all around, and Stella Artois on tap. 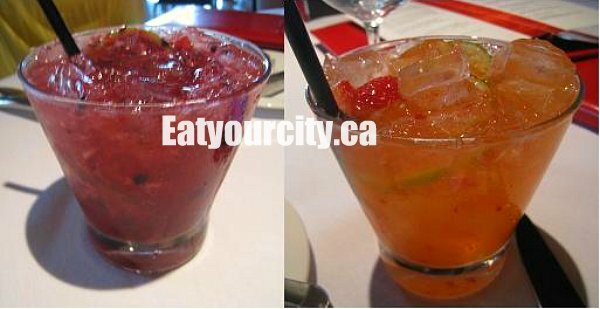 The Caipirinha's is Brazil’s national drink and not surprisingly, its also Pampa's signature cocktail. The fresh muddled fruit (choice and combinations of lime, strawberry, raspberry, blackberry) works well with the slightly sweeter white rum like liquor. The drinks that have a twist of lime in them go down smoother as the lime juice tempers the alcoholic bite. The strawberry-lime Caipirinhas is the favorite at our table. Our waitress brought over a few plates of appetizers while we waited for our friends to park. We initially thought they were fried mozzarella sticks and fries - but these turned out to be crispy cheesey-polenta sticks and fried cassava - the cassava was an interesting meld of potato-ey starchiness and had the texture of young sugar cane. is included in the rodizio, and I put together a platter from the array of raw salad veges and assortment of dressings, vinaigrettes and sauces, pasta salad, charcuterie platters, cooked vegetables and my favorite - a big platter of roasted pineapple layered with thinly shaved ham. I love roasted pineapple, especially with cinnamon! For veges and starches I have a roasted tomato, crisp brocollini, some blanched white asparagus, cherry tomatos, baby pickles and a few grapes that came along with a light rotini salad, a small scoop of grainy hummus and carrot sticks, some herbed baked baby potatos and a tasty sun-dried tomato penne and some marinated calamari rings to top off my heaping plate. Keeping the little circles indicating we want meeeeat! flipped over to green rather than red (pause in service and no more meat please) kept a steady stream of cheerful grill masters marching up to our table and slicing off portions of meat onto our plates. As some of us at the table preferred our meats on the more rare side, they kindly returned to our table with less cooked portions after they served others that preferred their meat on the well done side of things. First up on the rodizio was the cumin scented pork sausages. The seasoning and sausage recipe has been changed up since a few months ago - the sausage while still scented with cumin, takes on more of an Italian chorizo flavoring with a bit more heat and more juicy little bits of fat within (no pic as the waiter's arm blocked the shot). Next up was a sword skewer stacked up high with Parmesan pork cutlets which was moist and had a light Parmesan cheese crust on it. Meat #3 was Pampa's signature cut - the picanha... a succulent and tender top sirloin cut of beef, with just a touch of seasalt for flavoring. The layer of fat around this cut baths the meat in flavor and keeps it moist as it cooks. Nom. Meat #5 was a bacon wrapped chicken thigh. That's right, bacon wrapped! 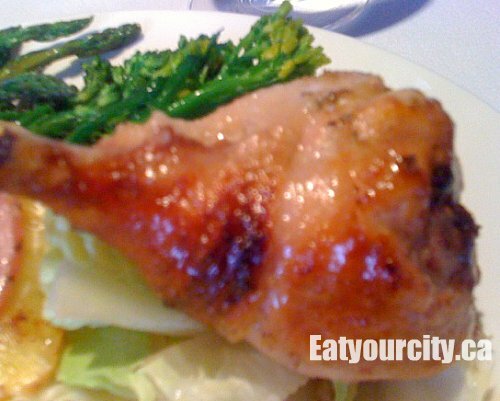 The bacon was roasted to a crunchy crisp with nary a trace of fat on it, while the chicken was super moist, tender and imbued with the distinctive smokey flavor of bacon throughout. Yummy yum yum! In the picture, its sitting on top of my pichana. Meat #6 was the skewered chicken leg, seasoned with a touch of sea salt and roasted to a glorious caramelized golden brown with crispy skin and succulent moist and tender meat. I think I still preferred the bacon wrapped version, but others that didn't like the smokiness the bacon imparted enjoyed this version more. Meat #7 was a garlic rubbed steak where a puree or grated garlic was spread over top of small round steaks before grilling. No picture as they only had med rare pieces. Fellow foodies reported it to be a denser and leaner cut with a strong hit from the garlic. Meat #8 was the prime rib steak, seasoned lightly with sea salt, this richly marbled succulent meat with a crispy layer of fat spoke for itself. It was super tender, very rich tasting as the layer of fat was crisp and there was plenty of melted fat tenderizing the meat...and the meat literally fell off the bones. The grill master in this case carved it off the bone, but we did see some tables request it on the bone as well. Meat #10 was the piece de la resistance... and we did not resist having several servings of the roasted leg of spring New Zealand lamb. It was possibly the most tender, silky and moist lamb I have ever had. Marinated in olive oil and seasoned lightly with simply a dusting of sea salt, this lamb barely had a trace of gameiness, and portions of it were golden and crispy from the roasting process. This was a popular item as we saw several legs of lamb circulating the restaurant throughout the night. I think our table alone ate half of the leg of lamb... NOM! One of the waiters jokingly declared it was very rude of us to use language such as "just a small piece please" or "just a bite please" when we started to get quite full from all the circulating sword skewers of meat meat meaaaat! After getting teased by some of the waitstaff that our table consistently had our disks flipped to the red side, we chatted, digested, sipped on our drinks, and headed back to the salad bar for some much needed vegetables to balance out some of the meats we've had tonight. We shared desserts as some of us were just too full after all the yummy rodizio, and we thought after all this meat, does Pampa do their desserts justice? First up was the chocolate mousse with a orange reduction, topped with a swirl of crunchy meringue, some mini grapes and a mint leaf. Though the mousse was light, fluffy and smooth, it didn't pair well with the orange sauce, and strangely, the edges were quite rough and jagged instead of smooth, giving it an unfinished and harried look. A blood orange, or better yet, a blood orange raspberry sauce would work very well with this mousse. The last dessert of the night was described by many of our foodies as "it tastes like Christmas!" A light grape jelly has rich notes of cinnamon, cloves and a touch of nutmeg and is topped with a light creamy topping. Silky, light and comforting, this dessert looked and truly tasted of Christmas! We started to food coma at this point, so I apologize, I don't remember the name of this dessert - only that it was traditional and it had the letter M somewhere in it. Overall, a great place for any meat lover to graze on five churrasco style meats at lunch, or have meat on the brain with 10 varieties of meats at dinner. And if you have room for dessert, all are made in house and surprisingly aren't overlooked. Now to waddle outside and walk off this huge meal! As a side note, in the show, they added seafood for "vegetarians" (obviously, she was in the wrong place and I will assume she meant pescatarian). The dishes added were salmon and prawns. Were those available? I agree that $45 is a bit steep.. but that's the price of some entree's in the city (and you don't get the salad/pasta bar.. or unlimited meat). I'd definetely go back for dinner for their leg of lamb... pretty yummy stuff (but for special occasions to make my wallet more happy). The lunch is cheaper - at ~$20, but it only has 5 meats, and missing that delectable leg of lamb and prime rib. I think the idea behind the seafood in the rodizio was to entice customers to think it was worth it, rather than paying $45 to visit a salad bar. But, that aside, you have disgraced your ancestors! The Chinese way is to stuff yourself with the more expensive stuff, not salad, sausages or chicken! So, you should have inquired (and stuffed yourself) with the seafood, lamb and ribs, hahaha! Hmm.. the last time I had a burger at Delux, it was a special, and was pretty tasty (and at a different location), so maybe you were unlucky? I usually stay away from surf and turf specials (though I love a good steak and lobsta tail), mainly b/c I find usually one is done well, and the other is forgotten about execution-wise, regardless where you do eat at. If nothing else its timing... one of the items always sits (sometimes under a salamander to keep it hot, and cook it some more) until the 2nd is done. Heehee.. I wanted to try a bit of everything! None of our group wanted to eat just meat or we'd all wouldn't be able to poop for a week! LOL!! Wait, I lied.. only one in our group only had meat :P And we all ate such a "respectable" amount, we all had to sit back and digest a bit before we could attempt to maneuver out the door LOL! Wow! My mouth literally watered! Everything looks delicious and tasty, it made me so hungry. I should probably go to the nearest steakhouse and grab some for myself.